Are You Caught in the Sales Circus? You didn’t realize the circus has come to town. The problem is that unlike every other circus, this one didn’t leave town. It’s taken up permanent residence and you are the main attraction. Ask yourself if what you’re doing is delivering the results you expect. If you were to start breaking apart your selling process and looking at the metrics, I’m sure you’ll find at least half of the metrics coming in with a failing grade. Oh, I forgot — you don’t have metrics, and oh, another problem, you don’t have a process. Welcome to the circus, because all you’re doing is creating activity that isn’t going anywhere. You have multiple processes you’re using, and each one is part of the 3-ring circus! You’re trying to reach multiple types of customers (these are just like the different acts in a circus). Finally, you’re trying to chase things down at all hours of the day and night, just like the multiple shows a circus puts on. Far too many salespeople are caught up in a “sales circus,” but they just don’t know it. What’s missing is a consistent process focused against a target market designed to identify outcomes you can solve. Last week I was with a salesperson who when I challenged where their new customers came from admitted they simply fell out of the sky. Made me realize this person was part of an outdoor sales circus. If you were to stop doing 50% of your activity, would your sales decline? 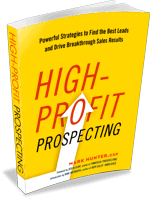 Salespeople freak when I ask this question, yet I contend sales would not decline. Reason I say this is because salespeople are committed to the activity and not the result. The feeling is if they just do the activity, they’ll have the results they need. Do top performers work twice or 3x as hard as you? No, I doubt it! They just work smarter, because they have a plan. I want you over the next several weeks to get serious about looking at how you spend your time and what you spend it on. I want you to find at least 60 minutes a day of activity you do that yields zero results. It’s there. You’ll find it once you get serious about not making excuses. If you want some help on this, I’m doing a webinar Aug. 8 at 3 PM with David Newman, who wrote the book Do-It Marketing. I’ve teamed up with David, who is a marketing whiz, because we both want to show you ways to get the sales circus to leave your town permanently! Don’t delay and check it out at this link.